If you just bought a Windows 10 PC or a license key, it is important that you check Windows 10 activation status after installing Windows 10 on your system. Though Windows makes it easy to know if your system is fully activated or not, it can be quite confusing at times. So, here are some sure-fire ways to check if Windows 10 is activated properly or not. As you can tell from the post title itself, there are multiple ways to check if your Windows 10 is properly activated or not. All the methods shown below will give you the same result. Follow the one you like or feel easy. For quick navigation, use the jump links below. This is one of the easiest and fastest ways to check if Windows is activated or not. This method works in Windows 7, Windows 8 and Windows 10. In the control panel, find "System" option and click on it. Under the "Windows Activation" section, you should see "Windows is Activated" if Windows 10 is activated properly. If Windows is not activated, you will see the Windows activation status as "Windows is not activated". The new settings app can show if Windows 10 is activated or not. Additionally, the settings app also tells you the activation method. i.e digital license or product key. Digital License: The digital license is given if you've upgraded from Windows 7 to Windows 10 in the free upgrade period or if you bought or upgraded Windows 10 from Microsoft store. Product Key: Product key license type is seen when you bought a physical or digital copy of Windows 10 from an authorized seller or bought a pre-installed Windows 10 system. This license type is also applicable to volume licensing and MSDN subscription. Go to "Update and Security -> Activation". On the right panel, you will see the activation status under the "Windows" section. You can also see the activation method. i.e, digital license or product key right next to the "Activation". In my case, Windows is activated via digital license. 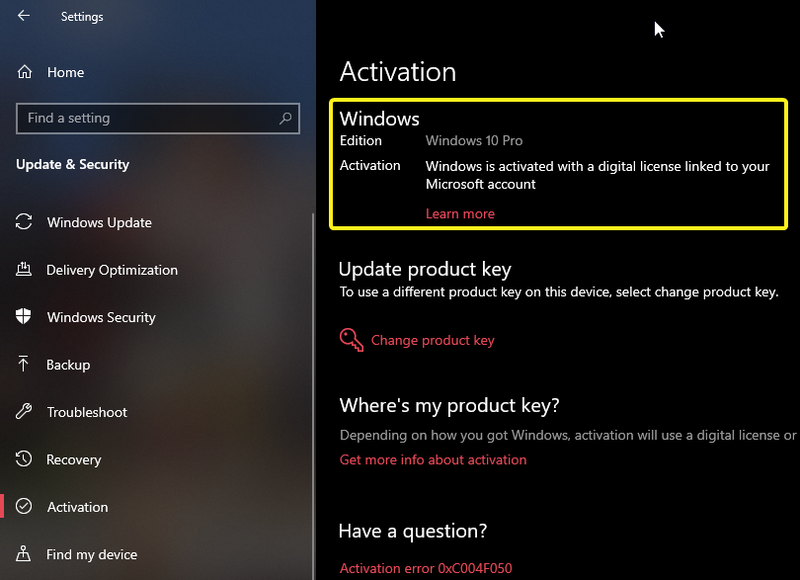 If Windows is not activated, you will see "Windows 10 is not activated" message next to "Activation". 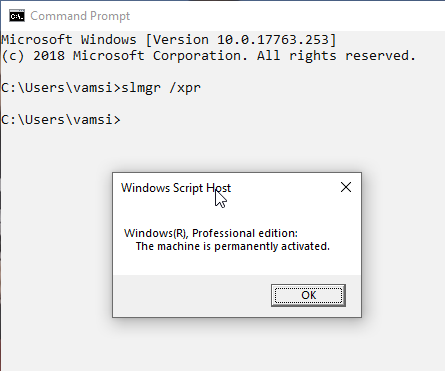 You can also use the command prompt and/or PowerShell to check if Windows is activated or not. When you use this method, you will also see what edition of Windows you are using. i.e, Home or Professional. Note: I'm showing in the command prompt but the same command will work in PowerShell too. Search for Command Prompt or PowerShell. Enter the following command and free Enter. If Windows is activated properly, you will see "The machine is permanently activated" dialog box. You can also see your Windows editor right on top of the activation status line. In my case, I'm using Windows 10 Pro edition. If Windows is not activated, you will see "Error: product key not found" message in the dialog box. That is all. It is that simple to check if Windows 10 is activated or not. If you like this article, you might also like to learn how to delete component store files to free up C drive space and how to change command prompt or PowerShell cursor size, color, and shape.